The amount of water supplied by the River Jordan, the streams’ springs, and the floodwaters on both sides of the Dead Sea, does not equal the very high evaporation rate on the lake. This problem, unfortunately, is also due to man’s intervention. Much of the water supplied by tributaries has been diverted for the water required for drinking and agriculture by the adjoining countries. 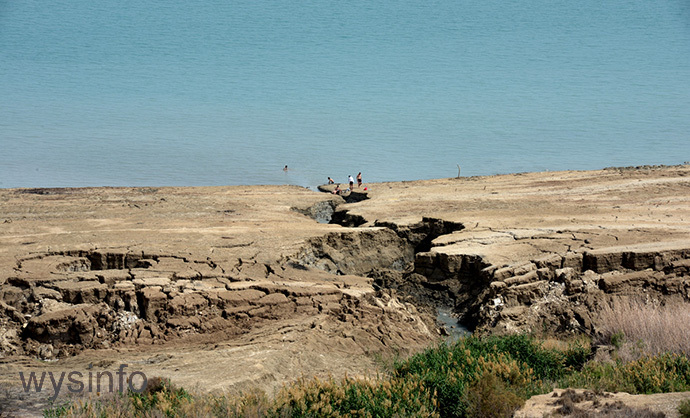 This, together with the natural evaporation rate, has resulted in the diminishing of the water level on the Dead Sea to almost one meter a year. Reversing this problem means that people will either have to stop using the water of the tributaries, or will have to bring water into the Dead Sea from a different source. The latter solution could also support other projects such as the generation of electricity, using solar energy and/or a potential height difference, water desalination and tourism. 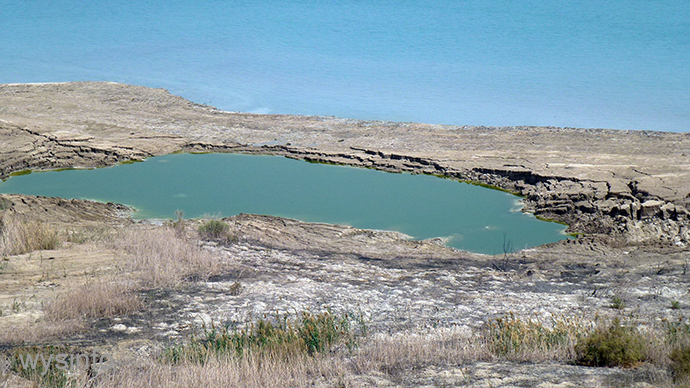 One of the alarming results of the drop in the Dead Sea water level is the creation of sinkholes along the shore line. This phenomenon has caused severe damage to property and, in some cases, has even resulted in accidents. These sinkholes are created in areas where the regressing sea have left layers of salt underneath the soil. Fresh water from the springs dissolve the layers of salt to a point that the upper non-salty layer becomes thinner and sinks. Some of the holes reach a size of about 40 meters in diameter and some have reached a depth of about 25 meters. More than a thousand sinkholes have already been identified and more are being created. This emphasizes the need to raise the sea level and the sooner the better. The most recent experiments on exploitation of solar energy, which have been successfully conducted in the Dead Sea region for some time, are based on an interesting phenomenon that is found in very few places on earth. The sun rays striking a shallow body of water penetrate to the bottom, are absorbed, and cause the water to warm up. The lighter, warm water rises and discharges its heat into the air; then it cools and descends once more. But when the water body contains salts at a concentration which gradually increases with depth, the warm water at the bottom cannot rise owing to its high specific gravity. In this case, a kind of hothouse forms, where the sun rays penetrate the top layers of water, are absorbed in the bottom and stored there. The lower layer of water with its uniform salinity acts as a large heat accumulator, able to store it for a lengthy period. Heat loss is minimal, as the bottom insulates below and the water, a poor heat conductor, insulates above. 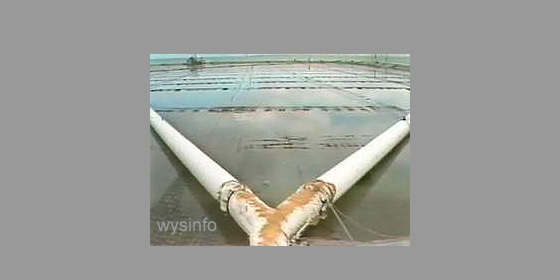 The solar ponds are based on this physical principle, with the addition of a technique that is brilliant in its simplicity. The pond consists of three layers; the warm water of the bottom storage layer is pumped through pipes to a heat converter consisting of a network of tubes containing an organic material with a very low boiling point. 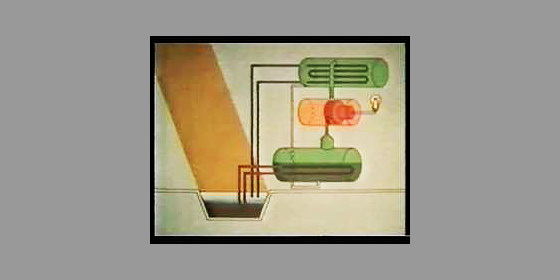 The vaporized organic fluid turns turbines which are connected to a generator that creates electricity. The vapor reaches a condenser activated by the cold water of the top layer of the pool; this cools the organic fluid, which then returns to the vaporizer for repeat use. The warm water in the vaporizer that boiled the organic fluid then cools and descends to the lowest layer of the solar pool where it will be heated up once more. The formation of waves by wind, which results in the mixing of layers of different density, is prevented by nets cast over the surface of the pool and the water surface is thereby kept smooth.A trial plant, that was able to provide 150 kw/h of electricity without pollution and by means of solar energy, from a pool area of 7000 m2, was created by the shores of the Dead Sea, demonstrating the idea. If a larger implementation of the process is developed in the Dead Sea area, it should be able to supply the needs of electricity to the Jordanian settlements as well as to the Israeli settlements around the Dead Sea. This, however, requires a political agreement, vision and good will from the leaders of the countries involved. Such a project can be combined with a far greater project for the sake of nature and the people of this area, such as the Mediterranean-Dead Sea Canal, or alternatively, the Red Sea-Dead-Sea Canal. Calculations have shown that a solar pool the size of the Dead Sea could supply more than the energy needs of Israel. The establishment of a large-scale plant requires a considerable amount of water of fairly low salinity for the purpose of creating layers of gradually increasing salt concentrations. A canal, planned to link the Mediterranean and the Dead Seas, could supply enough water to operate a solar pool large enough to produce a major part of Israel’s electricity needs. The idea of a canal joining the Mediterranean to the Dead Sea that would exploit the height difference between them to generate electricity was put forward as early as the end of the 19th century. The idea was voiced again several times over the years but rejected. After the energy crisis of 1973 and the increasing need to exploit alternative sources of energy, the economic feasibility of this project grew, with ramifications extending far beyond the mere production of electricity. A decision to implement the project was taken already then, and of the five alternatives examined it seemed that the route through Tel Katif, Halutza to Massada was the best. The system, a combination of a tunnel, canal and reservoirs, was planned to start at the Mediterranean coast and end at the base of a cliff facing the Dead Sea. An intake plant was to be built off the Mediterranean about 600 meters out to sea. Based on this plan, pumps would control the flow of 50 cubes of water a second through a seven-meter long pressure pipe to a height of 100 meters above sea level. From there the water would flow in an open canal 20 meters wide to a distance of 22 kilometers. Next the water would enter a tunnel five meters in diameter and 86 kilometers long and would flow east. South of Massada, on the Judean Plateau overlooking the Dead Sea, two reservoirs would be built, to serve the power station for use at peak consumption hours. The station would be built into the cliff facing the Lissan peninsula, which meanwhile would be connected to the shore. The water would fall from a height of about 400 meters through a pressure pipe and would turn the four turbines of the station, which according to the plan would produce 450 megawatts of electricity. The station was planned to operate at peak hours and would produce electricity without pollution. The project would be worthwhile, even if the only benefit was the generation of electricity. But there are also notable side benefits. What are these? For years the level of the Dead Sea has been gradually falling both on account of the tremendous evaporation and on account of man’s intervention. The use of the Jordan waters and its resources, both by Israel and by Jordan’s diversion of the Yarmuk river, have affected the current state of the sea. For many years, the water level has dropped by one meter every year. The inflow of Mediterranean water would permit the controlled elevation of the water to its original level and maintain it there. Because of the difference in salinity, the Mediterranean water would make it possible to implement the solar pool project, this time on a large scale. The project would furthermore provide water to wash away the salt that has crystallized in the ponds of the Dead Sea Works, to promote Marine agriculture by creating ponds for fish, crabs and algae built next to the power stations. It would supply cooling water for the power stations planned for the interior of Israel, thus relieving the pressure on the Mediterranean coast that could then be developed for summer resorts and tourism. 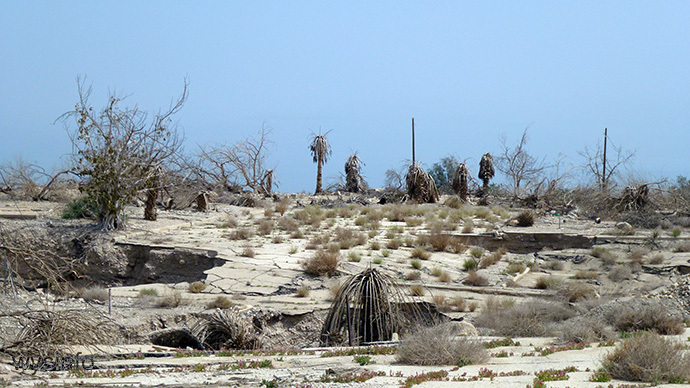 The project would create the effect of an oases for desert tourism and recreation. From the economic and professional viewpoint the advantage of the project lies in the fact that its sole raw material – water – is available, and therefore there is no dependence on outside suppliers; it can be stored and the price is fixed. The project envisages raising the level of the Dead Sea, and this without flooding the Dead Sea Works or harming the Jordanian potash plant during the replenishment phase, which would last five to twelve years, and during the stabilizing phase lasting about 40 years. Together this is half a century, the life span of the project. 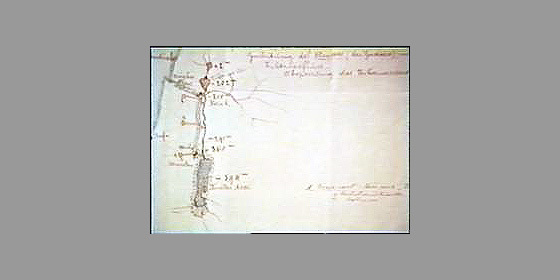 The plan for a Dead Sea canal was not without controversy. A re-assessment of the project done during the early 90’s argued that the exploitation of the potential height difference would be more valuable, from an economic point of view, for desalinating water rather than generating electricity. Current political circumstances have raised the idea of using an alternative plan to the Mediterranean-Dead Sea canal. This plan involves the creation of a canal and a series of projects between the Red Sea to the Dead sea, thus helping also to incorporate political advantages as well as economic ones, by creating mutual interests and obligations for adjoining countries.This Dead Sea – Red Sea Canal project will be an Israeli-Jordanian-Palestinian joint venture. The World Bank financed a feasibility survey for this project and in February 2016 an agreement between Israel and Jordan was signed for actualizing it. Under this agreement 4 pipes will carry water from the Red Sea to the Dead Sea. During the first stage of the project a 180 km pipeline is planned to be built between the 2 seas. This pipeline will carry approximately 200 million cubic meters a year and will be used in part to fill up the shrinking Dead Sea and in part for desalination purposes. A desalination plant will be built in Aqaba in Jordan. Israel will receive a certain amount of the desalinated water for the use in the south of the country while Jordan will receive, on top of what it currently gets, an equal amount from the Sea Of Galilee to be used in the north of Jordan. There is no doubt that any project undertaken will require the cooperation of all parties. Regardless of the approach, it is necessary to look at the area as a whole. 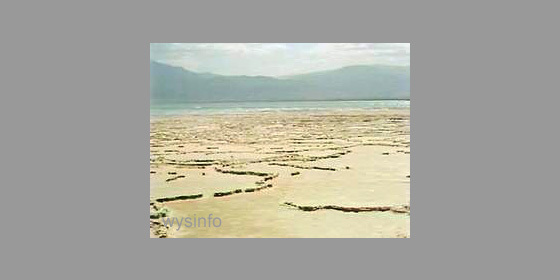 The uniqueness of the Dead Sea basin in terms of geology and nature, together with its archeological and historical importance to mankind, have stimulated the Friends of the Earth Middle East-EcoPeace (FoEME) to come up with a stand regarding the Dead Sea basin. There is a need, they say, for a holistic approach that supports an integrative concept for regional sustainable development. 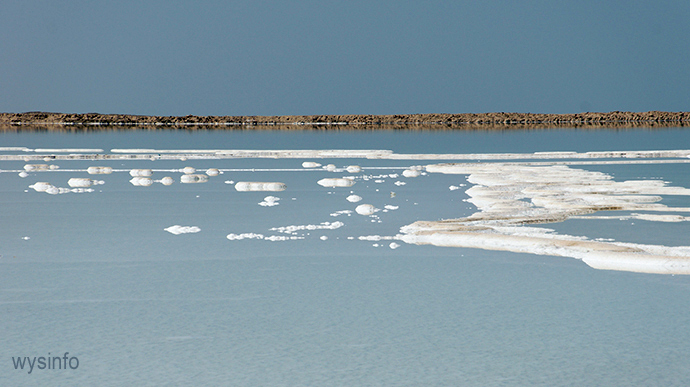 Registering the Dead Sea basin as a Biosphere Reserve with UNESCO, according to FoEME, will result in international recognition for the Dead Sea as a site of global significance and as a site in need of protection. Filling up the draining Dead Sea should be done, according to the FoEME, by reviving the Jordan river, thus also regenerating the flora and fauna that existed there. They call for balancing the need of man and nature. Whether this becomes a reality depends on the leaders of the countries involved. With the active political support of the international community it could serve as an example for other nations, showing that co-operation between countries for the future of next generations would make a better planet to live in.